It all started with a quick glimpse of the Old Granny Who Swallowed Thanksgiving Dinner graphic set on the Scrappin Doodles Facebook page yesterday and I knew I had to get busy creating a few things for my Kindergarten kiddos. I LOVE all of the Little Old Lady Who Swallowed a … books. It seems like my students love them just as much. Click on the picture below to take you to my TpT store to purchase your copy! To those of you finding this post via Pinterest, I'm sorry, but this unit is no longer free. So many people were having trouble downloading it through Google Docs that I have completely updated it and added an additional 20 pages and added it to my TpT store. I hope you understand. Feel free to check out the wonderful lesson plans that Deb at Writing Every Day Works created to go with the book and printables. What an amazing resource! Oh, wow! These are amazing! Thanks so much for sharing these great ideas. My kids always love the Old Lady books. These are awesome! Thanks sooo much!!!! On behalf of my students and I thank you for making these and leaving them free. I appreciate your hard work and generosity. Thanks so much for these ADORABLE freebies. I'm especially psyched for the syllable sort b/c we're working on syllables this week. Thanks again! @Amy, do you mean books from the series or more printables from this series? @Donna, we are working on syllables, too! Wow! Thank you so much for this. We love the Old Lady books in my classroom too! You are awesome for sharing. This is AMAZING! I am definitely going to use this in with the kiddos! Thanks so much!They love little readers too! Thank you so very much for sharing such a gem! Marlana, These are awesome. I can't wait to print them and use them with my little ones. Thanks for sharing such wonderful ideas! I love "stalking" your blog! WOW! You are A-MAZ-ING! Thank you so much for sharing these wonderful resources. I have a Mac and use a program called Combine PDFs to merge several pdf documents together. I don't know if you are a PC or a Mac, but that's what I use. Thank you for the beautiful pages! I just read this book today to my kinders. It will be great to have some literacy activities to do too. Thank you! Thanks for generously sharing these wonderful activities! I know my students will love them! Thank you so much for sharing! These look great! I appreciate that you shared them as freebies, too! I really like these activities! They are right up our alley of things we are working on. Thank you so much for sharing them! Thanks so much for sharing your wonderful activities! I am having trouble with fonts tonight---can you share which font you used for these documents? Thanks, again! Thank you SO much for all the wonderful activities for this book! It's one of my Thanksgiving faves & I can't wait to use all of this next week! Thanks so much, these are wonderful. I will be using them in my classroom very soon! I read this book today and the whole time I just wished I could get on the computer and download these activities! Thank You so Much! Your work is so colorful and well done! Thanks for sharing! Thanks for sharing! I love this book and these activities will be so fun for my kiddos! Thank you so much for sharing! These activities are so kinder friendly!! I can't wait to use them with the kiddos! These activities are great!!! Thank you so much for making them and they are freebies ,even better! Thanks again!! I had a little bit of trouble printing the readers, though! I printed them and I only got one book page per printed page when I think there is supposed to be two!! Am I wrong? Is anyone else having this issue?? It's still awesome! Thanks so much for these great FREE downloads. You are awesome!! I did have a problem with printing the pie page of the emergent book. It looks great on the screen, but when I print it, it comes out with a little pie overlapping the big pie. This happens both in color and the black and white version. Oops! These are AWESOME! Thank you for keeping them free so every child can benefit from them!!! :) Your stuff rocks! Super Duper cute! I saw those too and thought they were so cute. Many Blessings and thanks! You are so super sweet to share this & for free at that. I can tell you are a true teacher! Awesome! Thanks! Just found you thru Pinterest. Thank you for all the wonderful resources. Amazing! Just found your blog tonight through Pinterest. Thanks for sharing! Love the story, the Scrappin Doodles Graphics, and your awesome work! Thanks for sharing! I found this post on Pinterest. You are awesome! Your materials are so cute and are saving my first year of teaching :). I can't wait to use these this week! You did an awesome job! Thanks so much for sharing! Hopefully we will find the time in the next 7 school days to fit these in. I love these so much, thanks for sharing! These printables are awesome. Thank you. Thank you so much for these resources! I loved them all! 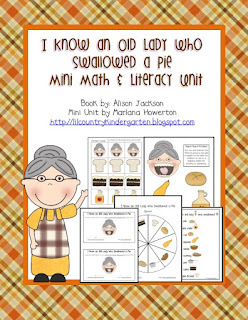 I used many of these activities in my literacy centers and small groups! Please tell me you are going to do similar activities for I Know an Old Lady Who Swallowed a Bell?! Thank you for taking the time to create and post these wonderful resources to share free of charge! I teach a self-contained class for children with multiple disabilities so any inspiring and time-saving resources that I find online make life so much easier when planning each week for age levels from 5 to 10! @kinderklein Great idea! I need to talk to Denyse at Scrappin' Doodles about making some graphics for it! Wow! These are great. I will definitely use these next year with my class. Thank you for sharing! Thanks for sharing! can't wait to use them this year!